Inspired creativity. In many traditions the fount of creative vision and the source of divinatory insight is located in an intelligent ‘other’, whether this is termed god, angel, spirit, muse or daimon, or whether it is seen as an aspect of the human imagination and the activation of the ‘unconscious’ in a Jungian sense. From the artistic genius to the tarot reader, the sense of communication with another order of reality is commonly attested. Such communication may take the form of a flash of intuitive insight, psychic or clairvoyant ability, or spiritual possession. In art and literature many forms have been given to the daimonic intelligence, from angels to aliens, and in the realm of new age practices encounters with spiritual beings are facilitated through an increasing variety of methods including shamanism, hypnotherapy, mediumship, psychedelics, channelling and spirit materialization. Theories of divinatory practices such as astrology, tarot or I Ching often assume a spirit or god-like intelligence at work in symbolic interpretation, and guardian angels abound in self-help literature. Mentors are an invaluable way to learn any craft. This is as true in Intelligence as it is in academics. Goods mentors make it possible to simply breath in their wisdom. They distill a whole career of wisdom and cross-pollination into the essence of what is important to know. In a way,they can see the future, or at least sense it. In the best of both worlds, the flow of wisdom and knowledge goes both ways and each mentors the other in a cross-pollination. In Allen Dulles: Master of Spies (1999), James Scrodes mentions his professional and personal involvement with Swiss psychologist Carl Jung. Deidre Bair reported further on Jung's covert affairs as Office of Strategic Services (OSS) Agent #488 in Jung, a Biography (2003). 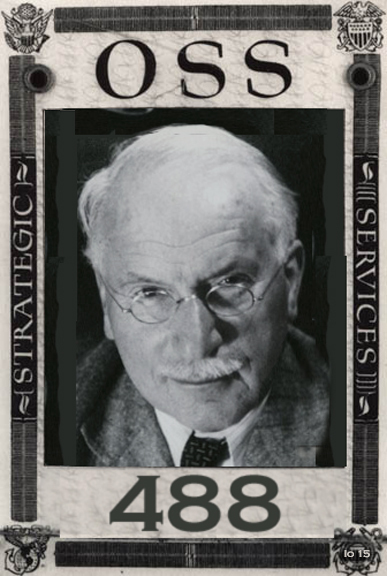 During WWII, Carl Jung was recruited by Allen Dulles, through OSS spy Mary Bancroft, to provide strategic psychological profiles on Hitler, Mussolini, and the German psyche for the Allies. She published her Autobiography of a Spy in 1983. – Nikolai Patrushev, head of the Russian Federal Security Service (FSB), October 2007It is not really surprising that historically occultism and espionage have often been strange bedfellows. The black art of espionage is about obtaining secret information and witches, psychics and astrologers have always claimed to be able to predict the future and know about things hidden from ordinary people. Gathering intelligence is carried out under a cloak of secrecy and occultists are adept at keeping their activities concealed from sight. Like secret agents they also use codes, symbols and cryptograms to hide information from outsiders. Occultists and intelligence officers are similar in many ways, as both inhabit a shadowy underworld of secrets, deception and disinformation. It is therefore not unusual that often these two professions have shared the same members. The ‘father of the British Secret Service’ was the Elizabethan lawyer, politician, diplomat and spymaster Sir Francis Walsingham. He was a Protestant and as a young man during the bloody reign of the Catholic Queen Mary was forced to flee abroad to escape persecution. While in exile, Walsingham learnt Italian and French and became acquainted with the work of the famous Venetian Secret Service that used its spying skills for trade and commerce under the cloak of diplomacy. William Cecil, 1st Baron BurghleyWhen Queen Elizabeth I was crowned Francis Walsingham returned to England. He was appointed as a secretary to the English ambassador to the French court in Paris and also worked as a secret agent reporting back the intelligence he gleaned to Queen Elizabeth’s Secretary of State, Sir William Cecil, later Lord Burghley. Between 1568 and 1570 Walsingham, who had become a Member of Parliament, worked in England in domestic counter-espionage exposing Catholic plots against the monarchy. Cecil WilliamsonIn 1570 Walsingham was appointed as the new ambassador to France. He proceeded to set up his own network of undercover agents in France, Italy, Spain and the Low Countries. The late Cecil Williamson, who worked for British Intelligence during World War II and later ran a witchcraft museum, told this writer that Walsingham often used witches as spies. Dr. John DeeOne of the famous occultists he is known to have recruited was Queen Elizabeth’s court astrologer and the magical architect of the British Empire, the Welsh magician Dr John Dee. Walsingham was involved in the machinations for the proposed marriage of the Duc d’Anjou and Elizabeth. At the spy master’s personal recommendation, the queen dispatched Dee to France with orders to report back on the progress of the marriage negotiations. The magus travelled to the Duchy of Lorraine and drew up the birth charts of both the Duc and his brother, who was also regarded as a possible husband for the English monarch. Dr Dee, probably influenced by Walsingham, diplomatically reported back to London that the stars suggested a political alliance would be far wiser than matrimony and the queen took his advice. In 1573 Sir Francis returned to London and became a privy councillor. This placed him at the heart of government and he proceeded to set up what amounted to the first organised foreign espionage service to operate from England. In 1566 he had put in place a pan-European network of spies extending as far to the east as Turkey and Russia, where Dr Dee reported on the goings-on at the Tsar’s court. This network mostly gathered intelligence on the military activities of the Spanish, who were England’s primary enemies at this time. Walsingham was also responsible for foiling the Catholic plot whose exposure led to the execution of Mary, Queen of Scots. Using Dr Dee’s psychic powers, he was apparently able to discover that the plotters were passing secret messages to the imprisoned Scottish queen hidden in bottles of wine. While travelling in Europe in 1562, Dr Dee had come across a book written by Abbot Trimethus of Spanhiem (1462-1516). This was a guide to writing ciphers and secret codes for magical purposes and Dee informed Sir William Cecil about his discovery. On his return to England Dr Dee adapted the abbot’s cryptography and gave it to Sir Francis Walsingham for use by his secret agents. He also passed on the political and military intelligence he had acquired during his travels across Europe. It has been alleged that Dee used the famous Enochian magical alphabet as a code to disguise this information. If he had been arrested his captors would not have understood it and dismissed it as nonsense. In 1587 Dee even claimed he had received a spirit message from one of his angelic contacts concerning a threat to the English Fleet. The message said that a group of disguised Frenchmen working for the Spaniards was secretly visiting the Forest of Dean. The forest was the centre for English ship-building and the French agents planned to bribe disloyal foresters to burn it down. Dr Dee sent his supernatural intelligence to Walsingham and the saboteurs, who were masquerading as squatters, were arrested. Information supplied to Sir Francis Walsingham from his European spy network convinced him that a Spanish armada would be launched against England in 1588. He asked Dee to use his knowledge of astrology to calculate the weather prospects for an invasion. The magus told him there would an impending disaster in Europe caused by a devastating storm. When news of this prophecy was leaked and reached Spain, naval recruitment fell and there were desertions of sailors from the Spanish Fleet. In Lisbon an astrologer who repeated the prediction was charged with spreading false information. In an act of psychological warfare, Dr Dee also informed Emperor Rudolf of Bohemia (the modern Czech Republic) and King Stephen of Poland that the predicted storm would “cause the fall of a mighty empire.” Rudolf, who was an occultist and Dee’s patron when he stayed in Bohemia, passed on the warning to the Spanish ambassador. Francis DrakeIt is a fact that in 1588 a great storm did scatter the ships of the Spanish Armada in the English Channel and aided the English victory. This metrological event was popularly credited to a magical ritual performed by the buccaneer Sir Francis Drake on the cliffs at Plymouth. Superstitious people believed Drake was a wizard and sold his soul to the Devil in exchange for success over the Spanish. It is claimed that he also organised several covens of witches to work magically to raise the storm and prevent the invasion. Meanwhile, as a result of scrying in his shewstone or crystal, Dr Dee saw a symbolic vision of a castle with its drawbridge drawn up (England) and the image of the elemental king of fire. As a result he urged the Navy to employ fire-ships against the Armada and they did so with good results. After Sir Francis Walsingham’s death in 1590, and the ascension to the English throne of the Scottish king James, Dr John Dee fell into royal disfavour. The new king had an unhealthy obsession with witchcraft and his early reign was dominated by this preoccupation. It led him to employ the Secret Service in his own personal vendetta against suspected witches. James I ordered its agents to hunt down alleged practitioners of witchcraft and expose their alleged plots against the monarchy. One of those involved was the Earl of Bothwell, accused of high treason for organising a coven of Scottish witches to work magic against the king in an attempt to seize the throne. To assist his secret agents in their new witch-hunting activities, King James persuaded Parliament in 1604 to pass a new and stronger Witchcraft Act to deal with the problem. The Bill was rushed through and it was made law within three months. Sir Francis DashwoodIn the 18th century the Secret Service became concerned at the activities of the so-called ‘Hellfire Club’ founded by Sir Francis Dashwood, later the Chancellor of the Exchequer and a close friend and political adviser of King George III. As a young man Dashwood went on the Grand Tour of Europe that was compulsory for aristocrats and he was initiated into a Masonic lodge in France. While visiting Italy he developed anti-Catholic views, violently broke up a celebration of the Mass and insulted the Pope. Even though he was an aristocrat, Dashwood was disgusted at the vast wealth of the Roman Church compared with the poverty of its devoted worshippers. He also became fascinated by classical mythology and decorated his country house at West Wycombe in Buckinghamshire with murals, paintings and statues of Greek and Roman gods and goddesses. It has been claimed secret agents infiltrated the Hellfire Club because of its many famous members. They included the Earl of Sandwich, John Montagu, who was the First Lord of the Admiralty, the Paymaster General Thomas Potter, several members of Parliament, the Lord Mayor of London, a son of the Archbishop of Canterbury, the Earl of Bute, who was the prime minister, and it has been claimed even the Prince of Wales. At least four members of the group were known to be actively involved in espionage. They was a radical MP called John Wilkes, a transvestite French diplomat, Chevalier D’Eon de Beaumont, the American statesman and philosopher Benjamin Franklin, and Sir Francis Dashwood himself. Wilkes had allegedly recruited the chevalier into the British Secret Service. During his stay in Russia on the Grand Tour Dashwood had spied on the court of the Tsar through his close friendship with the Grand Duchess Catherine. In Italy he gathered intelligence on the exiled Stuart dynasty and their supporters, although the head of the British Secret Service in Rome believed Dashwood was a Jacobite agent. In fact he was only pretending to support the Stuart cause and was passing on information about their activities directly back to London. In later years Sir Francis and Benjamin Franklin were involved in a clandestine plan to reconcile the American colonists and the British government to prevent the War of Independence. During World War II British Intelligence invited many occultists into its ranks because it needed their specialist knowledge and skills. The assistant director of Naval Intelligence during the war was Lt. Commander Ian Fleming RN, best known later as a thriller writer and the creator of the famous fictional spy James Bond 007. Fleming was also interested in astrology and numerology and he was a friend of the notorious magician Aleister Crowley, who had worked for MI6 (the Secret Intelligence Service) during World War I and in the 1920s and 1930s spying on Germans with occult interests (see ‘The Magus Was A Spy’ by Dr Richard Spence in New Dawn No. 105, November-December 2007). Ian FlemingIan Fleming conceived an audacious plan to lure a high-ranking member of the German government into defecting to Britain so as to provide a morale-boosting propaganda coup. This idea had been inspired by a novel written by Fleming’s brother, Peter, called Flying Visit (Jonathan Cape 1940). Peter Fleming was a journalist and also worked for both MI5 (the Security Service) and the propaganda section of the clandestine Special Operations Executive (SOE). The novel imagined that Hitler’s plane crash-landed in England and he was captured. The Reichminister and deputy fuehrer himself, Rudolf Hess, was chosen as a suitable candidate for the actual plot. This was because he was a supporter of peace with Britain and was also under the influence of astrologers and occultists. It was believed this could be used against him. Commander Fleming recreated The Link, a defunct Anglo-German friendship society of the 1930s that had a wealthy membership of Nazi sympathisers drawn from the British Establishment. Ironically, or perhaps coincidentally, The Link had been founded by Admiral Sir Barry Domville, an ex-director of the Naval Intelligence Department (NID), after he retired in 1930. Domville was arrested and interned in May 1940 because MI5 believed he was plotting a fascist coup d’etat supported by aristocratic peacemongers. The admiral was a friend of Major-General J.F.C. ‘Boney’ Fuller CBE, a famous military analyst who designed the tactics for the first tank battle in World War I. Fuller also invented the concept of blitzkrieg used so successfully in World War II by the German Panzers. Fuller was an open admirer of Hitler (he attended the fuehrer’s 50th birthday party in 1939), a leading member of Sir Oswald Moseley’s British Union of Fascists (BUF), a friend of Ian Fleming and a leading disciple of Aleister Crowley. In the 1930s Fuller formed the extreme-right wing Nordic League (aka the White Knights of Britain), allegedly established by Nazi agents. However in the 1950s he was a member of a MI6 supported group of Russian émigrés engaged in anti-communist propaganda. It has been suggested that Fuller was not interned during the war with other leading fascists such as Mosley and Domville because he was a MI6 double-agent. Ian Fleming’s idea was to persuade the German High Command in Berlin, and especially Rudolf Hess, that when war broke out The Link had not disbanded but had gone underground. It had allegedly regrouped and recruited even more prominent pro-Nazi members in the British Establishment including aristocrats and royalty. These were represented by the NID as influential people with the political muscle to overthrow prime minister Winston Churchill’s national wartime government, call a ceasefire and agree to a peace treaty with Germany. Under its terms Britain would keep control of its Empire and Germany would have free reign in occupied Europe. The Nazis also hoped that British troops would be sent to fight alongside the German Wehrmacht and the SS against the Soviet Union in a joint anti-communist crusade. Hitler did not want to invade and occupy Britain. Instead he would have preferred to negotiate a treaty with a sympathetic new government in London. It has been suggested that the only reason the fuehrer abandoned Operation Sea Lion – the proposed invasion of Southern England – and instead invaded the Soviet Union was to force Churchill to accept peace terms. If the Red Army had been defeated Britain would truly have been standing alone, as Hitler did not believe the Americans had the political will to enter the war. Unfortunately he underestimated the ability and resolve of the Soviets to defend their motherland and also the clandestine support that the US was already offering Great Britain. The NID plot to ensnare Rudolf Hess used bogus astrological predictions combined with political intelligence. Hess was persuaded that a Scottish aristocrat, the Duke of Hamilton, was willing to negotiate peace terms on behalf of the influential people at the top of British society who wanted to end the war. The duke had met Hess at the Berlin Olympics in 1936 and the deputy fuehrer for some reason thought he was a member of the surviving Hermetic Order of the Golden Dawn. Ian Fleming commissioned an astrologer to produce a faked astrological forecast indicating that 10 May 1941 would be a propitious date for Rudolf Hess to fly to Scotland and meet secretly with the Duke of Hamilton and other members of the so-called British ‘peace party’. Hess’ occult advisors had also told him there would be an unusual planetary conjunction on 10 May. On that day six planets would be aligned in the zodiac sign of Taurus and conjoined to the full moon. At the same time Hitler’s chart showed ‘malefic’ astrological aspects. Hess saw himself in the role of a messianic hero saving Germany from possible future defeat by making peace with the British. All the (false) reports reaching the deputy fuehrer about the political situation in England and the astrological aspects convinced him that his mission would be a success. Rudolf Hess flew to Scotland on 10 May 1941 in the firm belief that on landing he would be met by the Duke of Hamilton and the Duke of Kent and whisked off to London for a private audience with King George VI. He had been convinced by the misinformation fed to him by British Intelligence that these three men represented a genuine peace movement capable of removing the warmonger Churchill and agreeing to German terms. Hess had also previously met the Duke of Windsor when he had visited Berlin before the war. As a result Hess was persuaded that some members of the German-descended royal family were sympathetic to Nazism. Certainly the Duke of Saxo-Coburg, formerly Prince Charles Edward, a grandson of Queen Victoria and a close friend of the Duke of Windsor, had willingly embraced Nazism. In fact Hitler had appointed him as the head of the German branch of the Red Cross that was responsible for exterminating the mentally sick and physically disabled. Unfortunately instead of meeting pro-Nazi aristocrats and royals when he landed, Hess was captured by a local farmer and a Home Guard unit. They handed him over to the police and he was transferred to London to be interrogated by MI5. Unfortunately the British government completely mishandled the capture of Hess. It has been suggested that Churchill believed the subterfuge by the NID and SIS suggesting leading members of the British Establishment might be pro-German may have been based on fact. For that reason the government did not capitalise on Hess’ ‘peace mission’. The German High Command had also disowned him and said that his flight had been unauthorised. They also suggested that Hess might be insane so his value for propaganda purposes was undermined and diminished. Rudolf Hess’ apparent defection caused widespread panic in Berlin concerning the influence of occultism on the Nazi Party. The Gestapo immediately launched Operation Aktion Hess. On the direct orders of Hitler, they rounded up hundreds of occultists, psychics and astrologers, including Hess’s leading occult advisor Ernst Schulte-Strathaus. In June 1941 a decree was issued banning all public performances of clairvoyance, astrology, fortune-telling or telepathy. Anybody associated with Hess and his esoteric interests was thrown into concentration camps and occult secret societies were closed down. Because of staff shortages in the Gestapo, officers from the Naval Intelligence Service were drafted in to interrogate some of the arrested psychics. It has been claimed that they recruited some of them for secret operations using dowsing on maps with pendulums to hunt down British submarines. It has also been claimed that Ian Fleming and the NID was involved in a plot to silence the Spiritualist medium Helen Duncan, the penultimate person to be charged under the old Witchcraft Act of 1736. She was arrested in 1944 after holding a séance during which allegedly the spirit of a dead sailor from the sinking of the HMS Bolham physically manifested. As the news of the loss had not been publicly released, and the Admiralty was keeping it secret for morale purposes, Duncan became a target for the security services. She and other psychics were regarded as a serious threat to national security and they became the object of a MI5/NID dirty tricks operation to silence leaks. This suggests that the Intelligence Services actually believed these mediums had genuine powers. Duncan’s arrest and subsequent trial, which in fact was condemned by Winston Churchill as a waste of public funds, was allegedly meant to deter other mediums. The War Office was paranoid that military secrets about the forthcoming D-Day landings in Normandy would be revealed at séances and become public knowledge or passed to the Germans. MICHAEL HOWARD has had a lifelong interest in intelligence matters and the strange links between the occult and politics. Since 1976 he has edited The Cauldron newsletter (www.the-cauldron.fsnet.co.uk) featuring witchcraft, folklore and Earth Mysteries. He is the author of Secret Societies: Their Influence and Power from Antiquity to the Present Day, published by Destiny Books USA. © Copyright New Dawn Magazine, www.newdawnmagazine.com. Permission granted to freely distribute this article for non-commercial purposes if unedited and copied in full, including this notice.